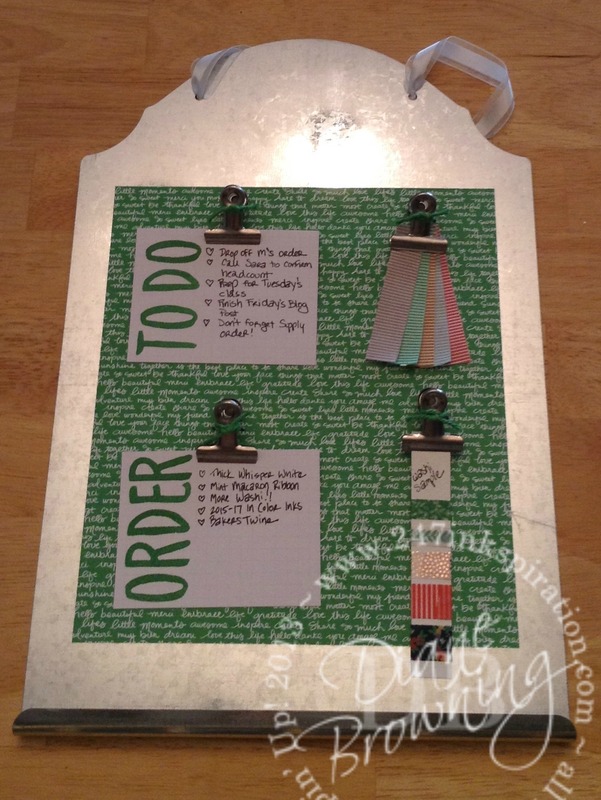 Today I’m back to sharing projects that I made for the Display Boards at OnStage this past April. All of today’s projects use the color Cucumber Crush. You can read about my other projects here: Tip Top Taupe, Watermelon Wonder, Mint Macaron, and Delightful Dijon. First up is my 3D project. I found this amazing metal message board in the dollar bin at a local store. Turns out it was actually $3 instead of $1, but I still thought it was an excellent deal. It had a chalk panel on the front so you can write your messages. I covered the chalk panel with pattern paper. I also changed out the twine that came with it to our Whisper White Organza ribbon. The clips are from an older Paper Pumpkin kit and I glued magnets to the back. I love having samples of the brand new ribbon and washi tape handy. My second project is my scrapbook page. This page features one of my all-time favorite pictures of my son, literally sailing through the air. He is running so fast that his feet aren’t actually touching the ground in this picture. I am amazed by the length of his stride every time I see this picture. 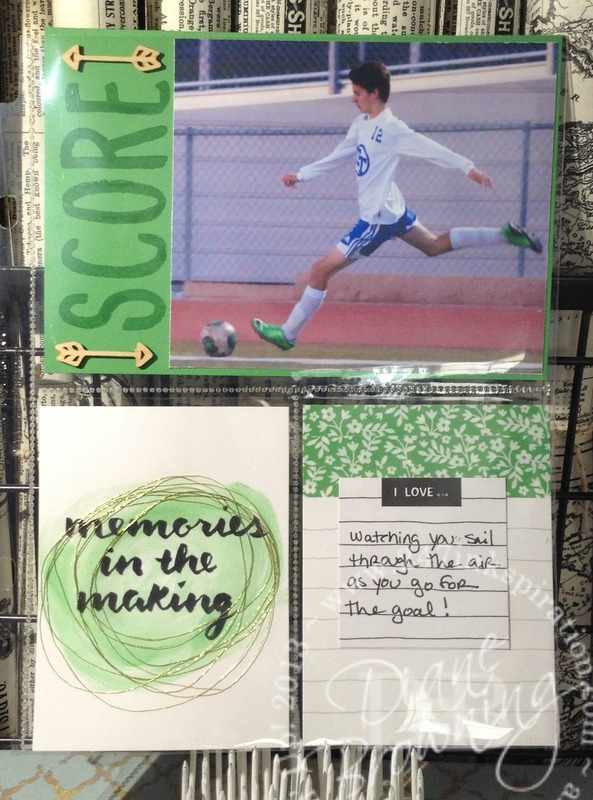 He loves soccer with a passion and it’s a complete coincidence that his boots are that same bright green. Next is my first card. 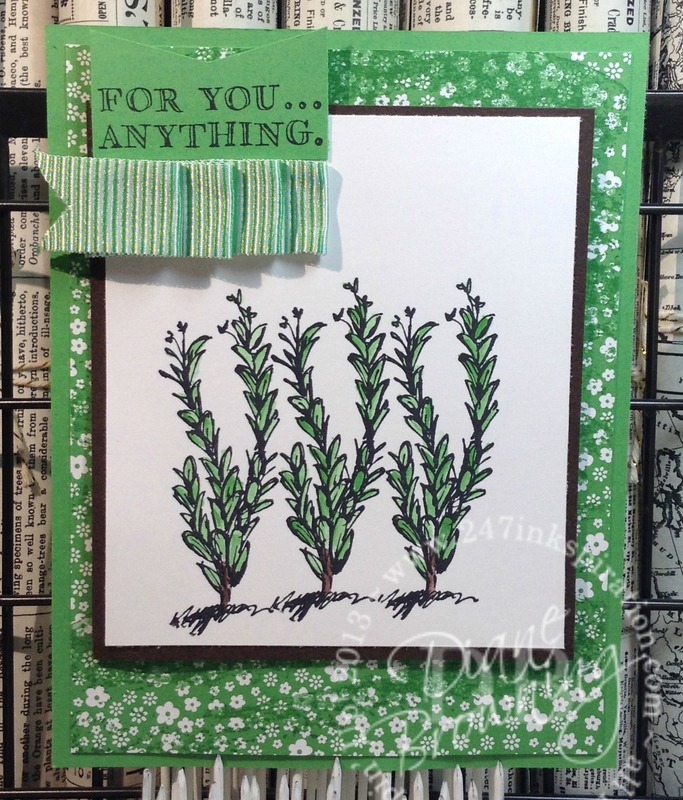 This card uses the brand new Host Stamp set Fabulous Flora. Once again I used the Watercolor Wash background stamp across the pattern paper to help tone down all those little white flowers. The image was stamped in the Archival Black ink and water colored with an Aquapainter. And here is the final project, which is also a card. This is the leaf stamp from the Remarkable You stamp set. I love big, bold images like this that just beg to be watercolored. I stamped this twice. Once here and a second time on a separate sheet of card stock. I then cut out each of the leaves and added them to the front of the card with dimensionals. You can see a bit the shadow created by the raised leaves. I hope you enjoyed the Cucumber Crush Display Projects that I made. I do have some exciting news to share now that I have shown all the Display Projects from April. I was once again selected to make Display Projects for the upcoming OnStage Local event in Phoenix. So, if you attend the Phoenix event, you will see my projects there along with other Demonstrators that were also selected. I am so, so excited to be chosen once again. 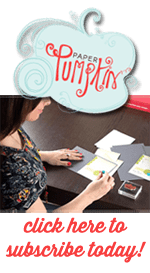 And humbled that Stampin Up has put their faith in me one more time. I love making things and sharing them with all of you.